Now you can show your friends that you like cowboys by wearing this bronc riding t-shirt. The rodeo t-shirt is available in styles for men, women, and kids and comes in many colors and sizes. 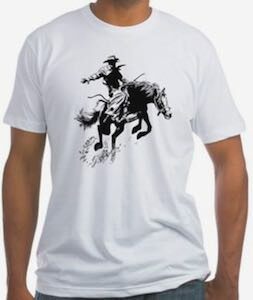 On the t-shirt you can see a cowboy doing some bronco riding and the horse is trying to get the rider of his back. If you like cowboys and rodeo then this shirt is what you should check out as the graphics are amazing and it can be a great way to remember your first visit to a rodeo and saw the bronc riding right in front of you.